Army Wife Post: Day Two Hundred Sixty-Two. Remember the 3D glasses that had the red and blue lenses?! They totally upgraded to gray lenses with an over sized plastic frame. Sooo much more stylish. And I was like a five year old super excited to see a Disney movie in 3D without a toddler in tow just a friend haha. Wow, you totally pull those off. Yay; fun! Hang in there. "Work it baby, work it..."
I'm SO going to see Up! Especially if I can find a 3D theater to see it in! 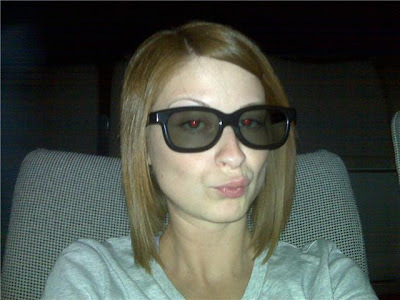 You're totally rockin those shades :) 3D movies are awesome (even if the glasses leave a little something to be desired)! You are adorable! I think they are definitely a great upgrade!